I see this blog as being a work in progress; one that I shall tweak and amend when the opportunity presents itself. Sitting, as I am on the sun-drenched terrace of a Portuguese villa, without access to my extensive library a few of my points could do with a little ‘firming up’. No matter. 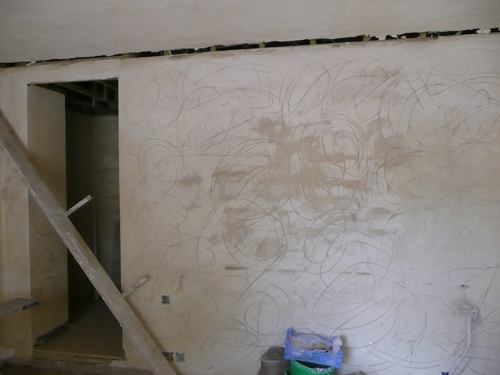 Having just received an email from an interior designer who now realises why I had been cautioning about the use of lime plaster and the problems of a short redecoration programme I feel that the time is right. A difficulty with writing short pieces on complex subjects is that one must generalise and qualify all those statements for which an exception immediately springs to mind. Lime and its use in historical buildings is certainly one those subjects. Headfort House, Ireland. Shows lime plaster repairs prior to redecoration. The use of lime in building, at least in the form of plaster, was the norm until the twentieth century. Thinking of our big cities alone, huge numbers of houses still retain lime-plastered walls under many layers of subsequent paint. Whilst one gives very little thought to the type of paint that is used on these it is certainly a consideration when it comes to the redecoration of newly refurbished historical buildings. For, although most plaster repairs carried out in the typical 1880s terraced house will be in the form of gypsum plaster, those buildings that have been the subject of extensive restoration – often with the involvement of outside agencies such as English Heritage – will almost invariably involve the use of new lime plaster. When lime plaster was the norm it was well-understood that a period of time must elapse before walls could be decorated – or, at least, before anything other than a temporary coating could be applied. The main reason for this was the length of time that it took the water component to be released in the form of moisture vapour. This problem can better be appreciated if it is realised that a square yard of lime plaster contains nearly half a gallon of water in each coat. 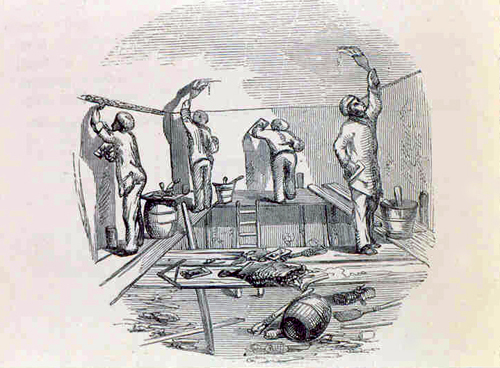 However, the sort of lime generally used in plastering hardens by a slow process of carbonation, reacting with carbon dioxide in the atmosphere over a period of time. Another possible problem is the high alkalinity of fresh lime. This diminishes with carbonation but must be considered especially if an oil-based paint is desired for the decoration. 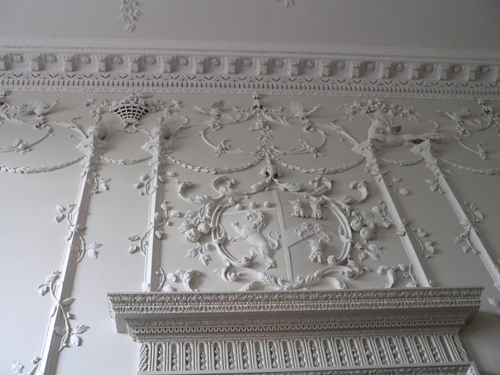 Dr Ian Bristow refers to the common practice, until quite recently, of decorating the plasterwork in newly finished interiors first in a porous water-based paint (soft distemper), pending final decoration in oil a year or two later. He cites the accounts for Henry Pelham’s house in Arlington Street, London, which show that the whole of the staircase had been painted in this way by January 1746 and was not decorated in oil until about two years later. While carrying out the paint analysis in a number of early nineteenth century houses I have invariably found evidence for an initial scheme of soft distemper under subsequent layers of oil paint. Thomas Cubitt, the builder, advised his clients to live “under builder’s finish” for two years to prevent expensive decoration from being spoiled. In a perfect world nothing would be applied to the walls for as long as a year, depending on the depth of plaster and the nature of the substrate. However that isn’t always practicable. The application of a true soft distemper is also not the most realistic option as it is fragile and the necessary skills to make it are rarely to be found. Whatever you do, take care to avoid the so-called traditional paint route. 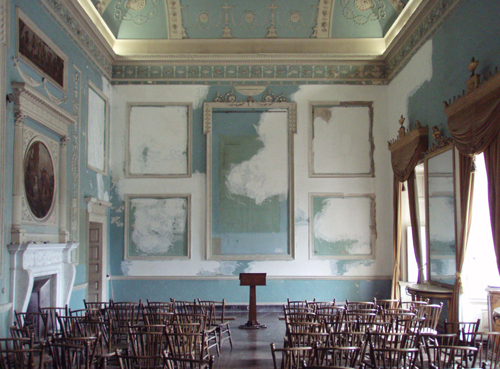 Richard Ireland, the expert on the conservation of decorative plaster has been faced with the subject of relevant paints many times, and he is one of the few specialists who have both the practical and theoretical knowledge to write on the matter. a) The first is the use of a ‘contract’ emulsion. These paints have the highest moisture vapour permeability rates of all emulsions and are specifically formulated for use on new plaster. Once the plaster is dry in depth more sophisticated emulsions can be used on top. b) Another option might be Classidur Superclassic. This is a non-conventional solvent based system with properties that make it particularly suitable as a substitute for a soft distemper. These include high vapour permeability and a lack of surface tension. In both instances there are limitations on the range of colours. Papers and Paints is one of the few specialists who are able to tint both these products. Although not recommended for application to large areas, oil paints may be employed, but only once an alkali resistant primer has been applied. Lime plaster is an excellent material in the restoration of historical buildings, but do remember that its use will require careful thought in terms of timing and its subsequent decoration. of lime being used in ‘interior hard-walling in 1935.
sure what paint type to use, or does it matter? Sorry for the boring question. I would appreciate your thoughts. Thanks Bernard. I hope that you received my email response. Best wishes. We had a grade 2 listed house newly lime plastered. By how much would you water the miscoat down, paint is from Little green because it can breath. I wasn’t aware that Little Greene had a breathable paint. If I were you I would use something like a thinned-down Dulux Trade Supermatt once the plaster is dry. You can always paint over that later when the plaster has cured. I am an artist and I’m working on a project using some sort of plaster. I want to be able to apply the plaster to a wall and then write text into it before it sets up. I imagine using a sharp object to to etch into almost set plaster. Any advice? Thank you Teresa. I’m afraid that this is not my area. It sounds rather like ‘Sgraffito’. Maybe you could learn something by following that up. I am in a similar position to Bernard Smith above. I have recently purchased an older (1917) property and I am looking for a little advice on the correct paints/primers to use on the original plaster walls. If you have on tips on the repair of small cracks that would also be very useful. Also – apologies for the boring question! Unfortunately the work is not as ornate as the other projects on this site. Thank you. Plaster of that age is most unlikely to be reactive as it will have carbonated fully by now. I should treat it like my own (1883) house using good quality conventional paints and fillers. If you did want to apply an oil-based paint to the walls it might be as well to use an alkali-resisting primer, but I doubt if you will need it. We are just getting our 200yr old farmhouse lime/hemp plastered and I was planning to paint with Earthborn claypaint after 5 weeks drying time. I believe we need a fully breathable paint. I called Earthborn who suggested a 4- 8 week drying time before painting. Is this a good product for this? We don’t want any off gassing either. I would hate to spend a load of money on this paint for it to blister or flake off! Any advice would be great. Your piece on decorating onto fresh lime summarizes and explains the issues very well, as does Richard’s to which you link. Thank you! Neither of you mention wallpaper, however. With the growing tendency to specify lime in heritage projects, we now regularly receive inquiries from anxious paperhangers who have to install our products on fresh lime. I was wondering if you have any advice on this particular question? Most of our papers are grounded/printed using acrylic paints (relatively impermeable I suspect), and I am wondering if the moisture given off by the lime as it cures will be sufficient to build up behind the paper, soften the paste and reduce adhesion? This hasn’t happened yet to my knowledge, but there is always a first time. Should we perhaps instead use what you and Richard call ‘contract’ emulsions where fresh lime is involved? And can these be pigmented in the strong, dark colours that our customers seem to like? There is real need for those who draw up specifications to address these issues, rather than blithely stipulating lime and a tight deadline in the same breath. We have a newly repaired ceiling using lime & horsehair plaster but the finish isn’t good enough just to paint, we need to paper it. Can you advise what product should be used to adhere the paper and also what type of paint we can apply over the paper? The key thing is to wait until the plaster has dried in depth. You should then be able to hang lining paper with conventional wallpaper adhesive and to paint it with an emulsion paint. Thanks for your article. Very very interesting. I wonder if you can help me with a scenario I am trying to resolve. We have a vaulted lath and plaster ceiling where a section has collapsed. It’s hard to see why at a glance. However the whole thing has been decorated with a ‘wall glaze’ type (non-breathable) product sometime in the 90′s. 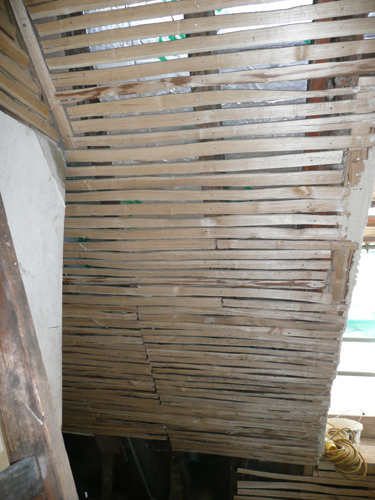 There is good ventilation to the rear of the laths and the roof is uninsulated. The room is space heated but relatively mildly. My instinct is the paint is the cause as it is stopping the plaster (which in itself looks fine, hair, lime etc) ‘breathing’ and thus causing a weak spot at the joint between ‘snot’ and main body of plaster. The ‘snots’ were left between the lathes when it came down. Can you put any science to my instinct that simply by stopping the breathing process (in this instance without any real risk of condensation – as this would be room facing on the paint face) would weaken the plaster enough for it to sheer like this? We’re a very, very old paint manufacturing company based in Leeds. We’re about to start work on the renovation (supplying paints and coatings) of the interior of an old building (built 1697) which is lime plastered. 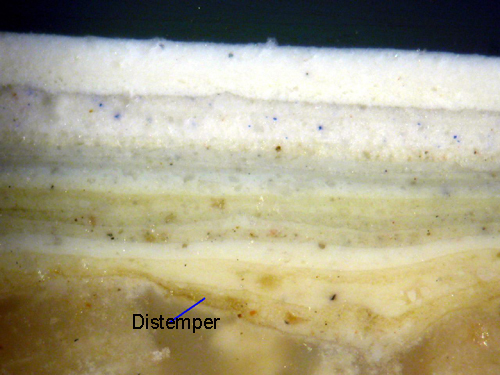 We make distemper (starch based) but I’ll probably look at a modern paint based on a polymer that is permeable to moisture for the simple reason that distemper rubs off when there’s any moisture present. Incidentally, breath-easy type paints are just based on softer polymers that don’t require the use of a coalescing solvent. They’re not necessarily permeable. The coalescing “solvent” is not strictly speaking a solvent and it’s not a HAP nor do the modern ones contribute to VOCs. They reduce the MFFT (minimum film forming temperature) of the harder polymers, so they will cure at a reasonable temperature. I apologise if you know all this, I found your website fascinating. Patrick, I have a grade 2 listed house which has been fully lime plastered following a complete building reinstatement. Do you know what moisture reading is suitable before I commence to apply lime wash? Some of the walls have been rebuilt using wattle and daub and obviously they are taking longer to dry but I would like to start the lime wash where I can, subject to knowing the correct moisture level. Thanks Derek. That’s a good question. I don’t know the answer. The issue is usually to do with the pH of the lime before paint is applied. I wouldn’t have thought that there would be much of a problem if you are using lime wash. It might be worth contacting SPAB. I have just started to apply lime wash to walls that were lime plastered 4-6 weeks ago, so they are ready for the lime wash. Can you advise whether or not I can apply by using a roller rather than a standard lime brush. There is no furniture to worry about as all rooms are empty. Thank you. It depends. If it’s old lime plaster in good condition you can paint on top. However, it also depends on the DPC and general state of the building. Lining paper might be the best option if the conditions are right. Hi Im looking to use lining paper on newly lime rendered wall. What process would you recommend? Can I size the wall or not? Once the plaster is dry, you should be able to size it and hang the paper.